In 2006 scientists voted and decided that Pluto is not classified as a planet any longer – it is now considered a “dwarf planet”. Up until that point it had been! So what changed? The International Astronomical Union voted on a new definition of a planet. By the new definition, a planet has to have become round due to its own gravity, it has to orbit the sun, and it has to domintae the neighborhood around its orbit. Because Pluto’s moon Charon is half the size that Pluto is, it does not meet the third criteria of “dominating the neighborhood”. It was therefore demoted to dwarf planet. Pluto was discovered in 1930 by Clyde Tombaugh and for a long time did not have a name, but was just referred to as “Planet X”. Then one day, along came a girl who gave the planet the name it has today! The girl was 11 year old Venetia Burney from Oxford England. Venetia was very interested in mythology, and suggested the name Pluto as it was a reference to the god of the underworld in ancient Greek mythology. Astronomers voted on the name between the finalists Minerva, Cronus and Pluto, and you know the rest – Pluto won! Charon – discovered in 1978 and is the largest of Pluto’s moons at 648 miles in diameter which is half the size of Pluto itself! 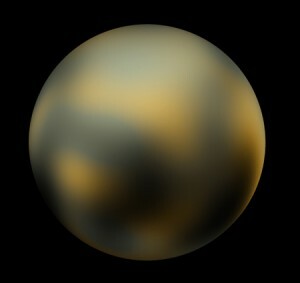 Pluto is 5.906 billion km (3.670 billion mi) from the sun. Pluto’s rotation takes 6.4 Earth days to complete. One year on Pluto actually lasts 248.5 Earth years. Pluto’s atmosphere is believed to be made of mostly methane and nitrogen.